Instructions: Card Size: 5 3/4 x 5 3/4". Cut a piece of decorative paper 5 1/2 x 5 1/2" and glue it to a white folded card base. Die cut 4 frame pieces all the same size to make a square frame (use the frame die without inset to make a plain white frame). Use foam tape to attach frame to card front. Stamp zig zag border 4 times, once with each color-Magenta Hue, Leaf Green, Tiger Lily and Forget-Me-Not, die cut and trim each piece to fit the frame then glue each piece onto center of each frame side. Stamp and die cut buttons in 4 colors (same as border pieces) color outside parts of flower buttons with orange, blue, pink, add floss to button holes and pop each up in a corner of the frame. Stamp and die cut pocket using Magenta Hue and add sentiment with Tiger Lily then sponge edges with Orchid and color button. Add Crystal Lacquer to the needle and glitter pen on the thread and also to the stitch lines of the borders. Foam tape pocket to card over bottom part of frame. Add pearl swirls coming out of pocket. Stamp flowers in 3 sizes using Forget Me Not and sponge color on front and back, die cut. Form flowers and glue layers together. 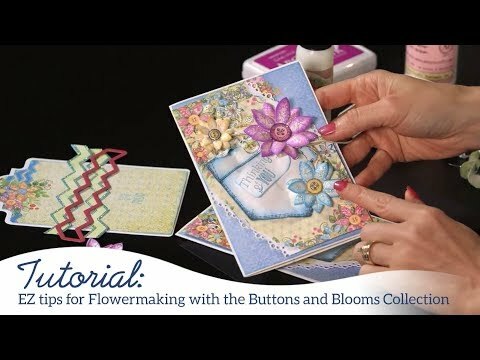 Add floss to buttons and glue to centers of flowers. Stamp, die cut and color leaves and heart flowers. Arrange all flowers and leaves to look like they are a bouquet in the pocket and also add in some green stamen in clusters to finish card.